Ai4 Cybersecurity is a two-day conference taking place on April 29th and 30th, 2019 in New York City. 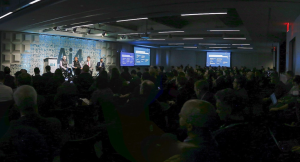 NEW YORK, NY, UNITED STATES, April 8, 2019 /EINPresswire.com/ -- The two-day cybersecurity conference will occur on April 29th and 30th, 2019 in New York City. Executives and data practitioners from Fortune 500 companies, government organizations, and leading cybersecurity firms will be in attendance to learn how artificial intelligence is impacting cybersecurity operations. One speaker that the audience eagerly awaits is Wayne Chung, the Chief Technology Officer of the FBI. His talk, entitled: "Artificial Intelligence and Cybersecurity: Math not Magic," will explore how the field of cybersecurity has slowly progressed from an art to a science. It has been a long and complicated journey that is still punctuated by misunderstandings and lack of rigor. The field of artificial intelligence; however, has transformed from a science to something more akin to magic. The combination of the two has led to a complex, nuanced, and buzzword-laden field that may leave many of us insecure and overly reliant on tools we fundamentally don’t understand. This talk will cover some of the realities of AI systems in cybersecurity and how they can be leveraged as a force multiplier for the time and resource limited cyber security analyst. Visit the conference agenda to see other speakers. As attendance is by application-only, attendees must apply to attend the conference. Ai4 Cybersecurity is part of the Ai4 Conference Series which organizes industry-specific conferences centered around AI applications. In 2019, Ai4 conferences will educate 1500+ top executives & data practitioners at the world’s largest companies about how they can responsibly leverage AI today. Confusion is still commonplace when discussing AI for the enterprise; from basic definitions all the way to implementation. Through our conferences and content, we aim to provide a common understanding of what AI means to the enterprise. Visit our homepage at ai4.io to learn about each of our conferences: Ai4 Finance, Ai4 Healthcare, Ai4 Cybersecurity, Ai4 Retail, and Ai4 Telecom. CALL FOR PRESS: Are you a journalist who writes about cybersecurity? Do you write about AI in cybersecurity?! Email us at info@ai4.io to request press credentials.